Overview: The course provides expert level knowledge of the IT Quality Index framework. 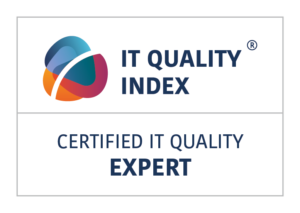 The course explains how to communicate the benefits of having knowledge of IT quality to executives and internal IT teams. Candidates will understand the processes of assessment, data processing, benchmarking and presentation to IT and business executives. Target group: For IT managers with the course being focused fonIT quality, team leaders, IT quality managers and CIOs. This course is targeted to individuals aiming to become Certified IT Quality Experts (CITQE – internal use) or Accredited IT Quality Expert (AITQE – commercial use, consultants). This course is mandatory as part of the licensing process for gaining Accredited IT Quality Expert certification. This accreditation is required for consultants from companies who intend to become an Accredited IT Quality Index consulting partner – AITQP. Course Learning Objectives: This qualification represents an expert level of knowledge in the IT Quality Index framework and the concept of quantifying the quality of IT into a management focused form. 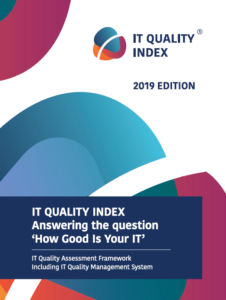 The course participants will gain expert knowledge of the 48 quality dimensions, how to assess actual and target levels along with how to identify the areas with the greatest improvement potential. Candidates will learn how to manage quality assessment sessions, how to process the captured information and interpret and communicate the resulting data. Participants will gain knowledge of how to focus the communication with the business on the overall quality of IT rather than only on quantity driven operational performance. Candidates will gain an understanding of the central data processing logic, licensing rules and the way of working within the ITQI community.